CGS Newsletter 003 Available Now! The third issue of the CGS Newsletter is now available both in print and online. Click the URL to download the PDF version. 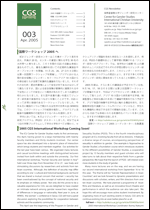 Continue reading CGS Newsletter 003 Available Now!.